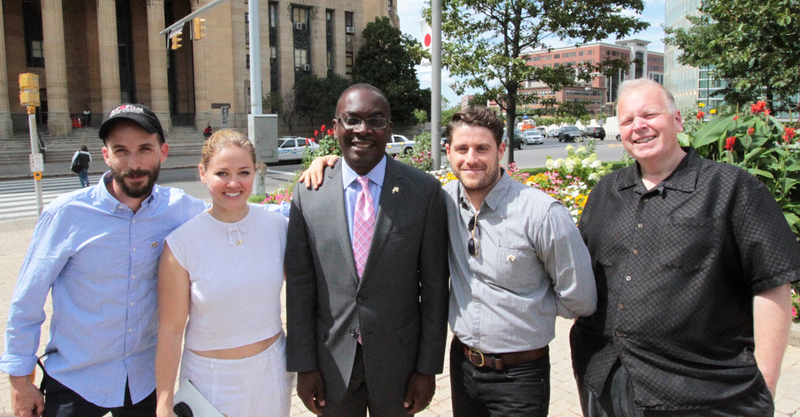 (August 6th, 2015) At a press conference in McKinley Square today, Buffalo Mayor Byron Brown announced that the feature film “Two for One” had begun shooting in Buffalo. 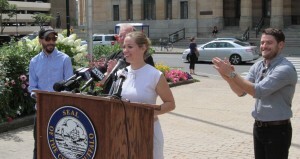 On hand for the announcement along with the Mayor was Director/Actor Jon Abrahams, Actress Erika Christensen, Director of Photography Matt Quinn, and Buffalo Niagara Film Commissioner Tim Clark. Abrahams expressed his excitement to bring the shoot to Buffalo, home of his longtime friend Quinn, and how impressed he was with the Buffalo locations and the professionalism and expertise of the Buffalo based production crew. “Two for One” tells the story of how a young up-and-coming artist in New York City (Abrahams) has his life and dreams forever altered when the tragic events of 9/11 take the lives of his two best friends and he accepts guardianship of the couple’s two young daughters. Now 11 years later, and teaching art at an elementary school, he raises the girls as if they were his own, but the financial grind to live in NYC is too much, so he decides to take the girls away from the only place they’ve ever called home and move back to Buffalo where he grew up. This “non- traditional” family now faced with change, new surroundings, and a new journey, must learn how to adjust to this new life, while trying to find themselves along the way. Along with Abrahams (Meet The Parents, Scary Movie) and Christensen (Traffic, Parenthood), Two for One will see feature actors Annie Potts (Ghost Busters, Designing Women), Mickey Sumner (The Borgias, Francis Ha) and Stephen McKinley Henderson (Lincoln) in front of the camera in Buffalo. Two for One will also feature an all Buffalo crew with the support of ND Studios, Filmkiln, and Pan American Sound. 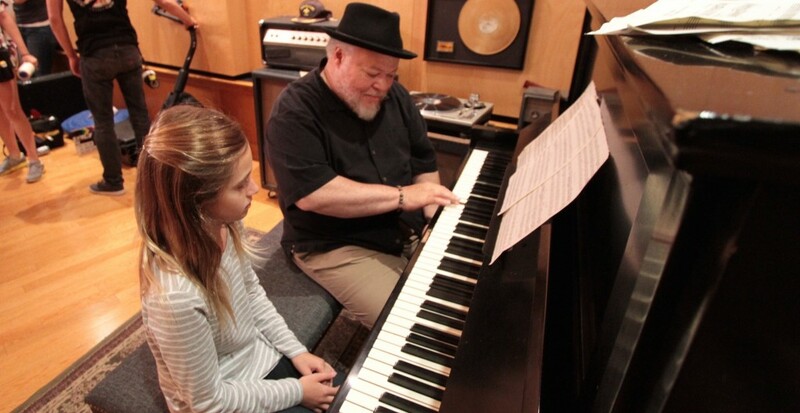 “Two for One” Actor Stephen McKinley Henderson(Lincoln) rehearses scene with actress Nicole Berger at GCR Studios. Voluntary background extras will be needed for “Two for One” for various scenes now through August 17th. Interested persons over the age of 18 should email a snapshot with contact information to westernNYcasting@gmail.com .